What Does “All Inclusive” Mean To You? 7 in Jamaica, 3 in St. Lucia, 1 in the Bahamas, and 1 in Antigua. BEACHES (geared toward infant to adult with Sesame Street and Crayola Programs. 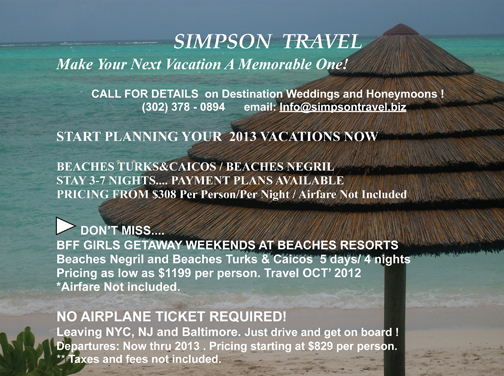 This resort does have an Adult Only component) Locations: 3 in Jamaica, 1 in Turks and Caicos. Crystal, I never really thanked you for arranging everything for us. I know I can go online and do it myself but I’m not the professional and would worry constantly about making an error. It’s nicer to have somebody who knows what they’re doing. Thanks so much. ~ Joyce N.
next vacation. ~ Tiffany S.
← Previous Story A Rock And Roll Event!